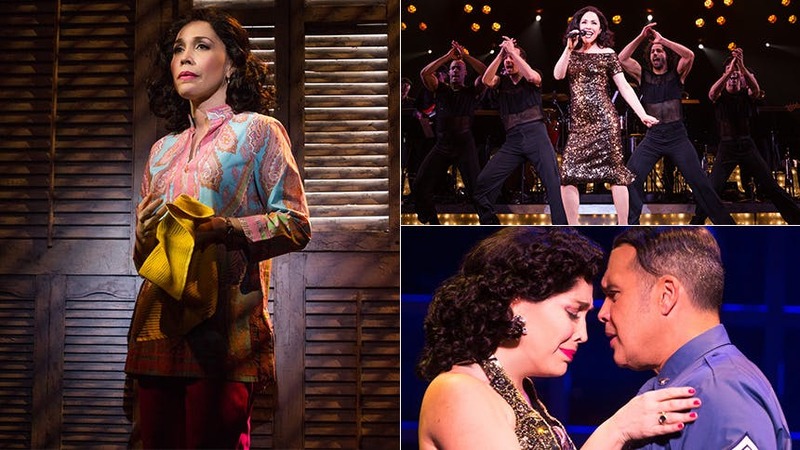 Drama Desk Award winner Andréa Burns is back on Broadway as Gloria Fajardo, the fierce and talented mother of pop icon Gloria Estefan, in the hit new bio musical On Your Feet. The In the Heights, Nance and Songs for a New World alum can also be seen on a much smaller stage in her brand-new Feinstein’s/54 Below solo show on November 16 & December 14. Below, BroadwayBox chats with Burns about the Estefan tune that clinched the deal, Hal Prince’s Christmas Party sing-along and more. 1. What’s the most significant thing Gloria talked to you about that informed the way you play her mother, Gloria Fajardo? Gloria, as well as Emilio and everyone in the family I’ve met, has communicated to me what a powerful figure she is. For as strong a personality as she is, they must love her a lot because she has a real hold over all of them. One of the most informative things for me was watching an interview of Gloria and her mom on Entertainment Tonight, and how this worldwide legend kind of became 15 again in her mom’s presence. Her mom is very charismatic, hilarious and passionate, and that spoke to me more than anything. The impact she has had on everyone in the family was the most fascinating thing for me to explore. 2. You get a call about the Gloria Estefan musical, what’s the song you most hope your character is singing? 3. It’s been 20 years since Songs for a New World, and JRB just released that amazing demo recording. When’s the last time you revisited that album/score? Every December, we have the great honor of celebrating the holidays at Harold Prince’s Christmas party. We’ve been invited pretty much since Songs for a New World because we were like Daisy Prince’s kids—we were part of her first big project and were welcomed with open arms. Last December, we were all there reunited in the room including Billy Porter—the original cast member who was unable to make the recording—so we all sang “Hear My Song” together, and it was pretty magical. That’s when it comes up. The most powerful experience for me is when we get to be around the piano with Jason revisiting that together and blending our voices together again. That was my first family in New York and I still feel the same way about all them. 4. What's your signature dish? I make a pretty mean picadillo, which is a Latin dish made with ground beef, vegetables and Latin seasoning. 5. Your 54 show is about finding grace at 40, what do you wish you could go back and tell 20-year-old Andrea? I would say, ‘what I’m bringing to the party is more than enough.’ I think in your 20s you spend a lot of time trying to define yourself and typecast yourself—even cutting off pieces of yourself you feel won’t fit in the box; I think the revelation is that there is no box. You’re 3D flesh and blood and that's what people relate to. Now at 40, I can really step into that with confidence and pride, and Gloria Estefan is the best role model possible. She’s taught me a lot about that. She’s so genuine always. You’d think somebody so famous would be protective of herself, but she’s just so open and willing to be herself, and I constantly look to her as a source of inspiration. See Andréa Burns tear up the floor and then your heart in On Your Feet at Broadway's Marquis Theatre, and don't miss her limited Feinstein’s/54 Below show on November 16 & December 14.